As numbers of elephants have decreased by some 350% in the last 70 years and by 110 000 elephants in the last ten years (Great Elephant Census) due to poaching and habitat loss, we are honoured to have saved a few. We are even more thrilled to be able to connect you with Elephants through our unique interactions, so that you might see them for what they are, and therefore think a little bit more about their future, and indeed many other species, in an ever changing and modernising Africa. Zambezi and Bela, were born to mothers Shan and Mussina and are our 6th and 7th family members. We offer close up and personal encounters with our elephants carried out with cheerfullness and respect for the welfare of both our majestic residents and you our guest. Here you will learn all about our continent's gentle giants, their intelligence, their bodies, their behaviour. You will leave humbled and moved, and a lifetime ambassador of holistic wildlife conservation. The situation of the African elephant is a precarious one not only because of the value of the tusks but also owing to the fact that they are destructive, expensive to maintain and difficult to protect. Habitat encroachment and competition for the same natural resources also causes friction with local communities. At AWE we work proactively to keep our animals healthy, and safe and are involved in holistic conservation efforts through research and work with our local community. Our latest additions are Zambezi, born to Shan on the 4th October 2015, and Bela, born to Mussina on the 23rd September 2016. Our elephants represent the many difficulties of managing wildlife in Africa today. Deemed "problem" animals, Mussina, Chishuru, Nuanedi, Chova and Shan were given to us otherwise they would have been culled. Their classification as "problem" animals is a direct result of their impact on flora, diminished land, human/elephant conflict and legislation, a scenario all our wildlife faces today. They highlight the conservation issues and difficulties facing wildlife and conservationists alike in a changing and modernising Africa. Together with giraffe, wildebeest, red hartebeest, kudu, waterbuck, impala, eland, zebra, ostriches and warthogs, our elephants share 300 hectares of bushveld. They have access to 2 large dams and over 40 shrub and tree species can be found. In addition our elephant have access to a further 2000 hectares to free range feed. 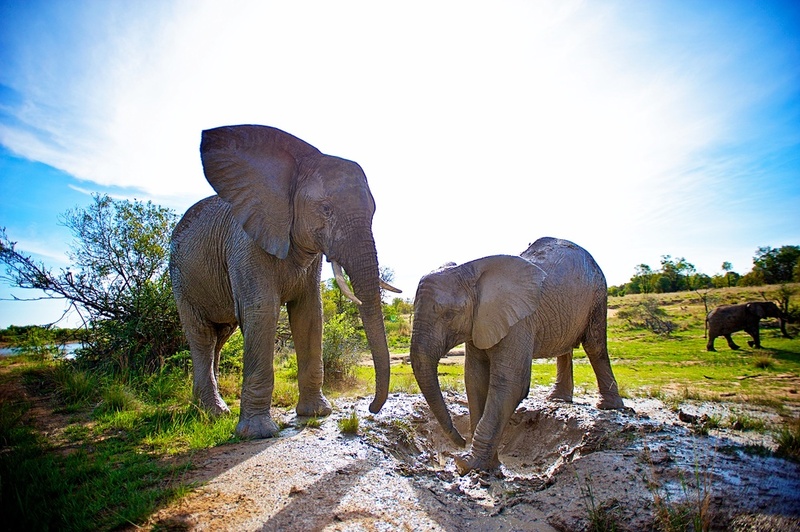 Adventures with Elephants is situated in the Waterberg district of the Limpopo Province in South Africa. The area is characterised by deciduous forest or bushveld and there are archeological finds dating to the Stone Age.